Elephant's high-tech load chains are approved by DIN 5684, one of the world's strictest standards. This is the special heat-treated load chain of Grade V (100kgf/mm2) whose tensile strength far surpasses JIS Grade V.
Double pawls supporting fail-safe brake mechanism. Even if by any chance one of the two pawls becomes unserviceable, the other will still remain operative, and the brake system remains secure. Hooks of easier handling shape. The opening of the hooks has been made wider for easier handling and working. And, if by any chance the hook is overloaded, there is no fear of its breaking, and it will simply start straightening out gradually, avoiding any load drop or human injury. The tough gear case, reinforced with four ribs and four knock pins, provides accurate gear centering and high mechanical efficiency. This provides smooth operation of the hand chain when pulled sideways. Elephant's high-tech load chains are approved by DIN 5684, one of the world's strictest standards. This is the special heat-treated load chain of Grade V (100kgf/mm2) whose tensile strength far surpasses JIS Grade V.
Drop forged, properly normalized hooks. Safe, dry, long-lasting friction disc. Very light and compact body, (9.2kg 1ton). Best wear resistance on record for manual hoist. The chain weighs only 0.25 kg per meter. 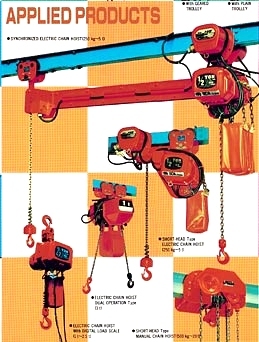 It keeps the hoist still light even with extended lift chain. Body in attractive golden color plating and powder painting, with rust-resistant chain. Light and compact. Good for works at high places. Highly durable load chain of our own manufacture. Totally enclosed steel plate construction. Wiring: Simple plug-in type connection of wires. In case of overloading, it gradually elongates without fracture. A compact design that provides safety and high power. Versatility and unrivaled performance are the keys to their great popularity. Various accessories accommodate all operational environments. A low-noise design satisfies today's demands. 15kg, net weight with a short head. Mechanical and power brakes provide outstanding braking. Overload and overwind preventions are integrated in one safety device. A superstrong white load chain for tough jobs. Superstrong surface-hardened load chain with 80kgf/mm2minimum breaking stress. Upper and lower hooks and a safety latch ensure safe, smooth operation. Load chain, hooks, braking parts have 5 times safety factor. Stronger hook and safety latch. Tip-supporting safety latch brings easy handling. Round shape lever handle brings easy operation. Hooks are safe even when accidentally overloaded. Shock-resistant gear cover and brake cover. Locking out dust and rain. Bolted rubber grip assures safe operation. Extraordinary braking force, easy release, and the finest antirust treatment. The brake mechanism is designed to avoid seizing. The chain stopper protects the body. A special surface-treated, rust resistant white load chain. Superstrong load chain for heavy-duty use.